VANCOUVER , BC / ACCESSWIRE / October 24, 2018 / Renaissance Gold Inc. (TSX.V: REN; OTCQB: RNSGF) ("RenGold" or the "Company") is pleased to announce the commencement of diamond drilling on its Ecru Project, Lander County, Nevada. 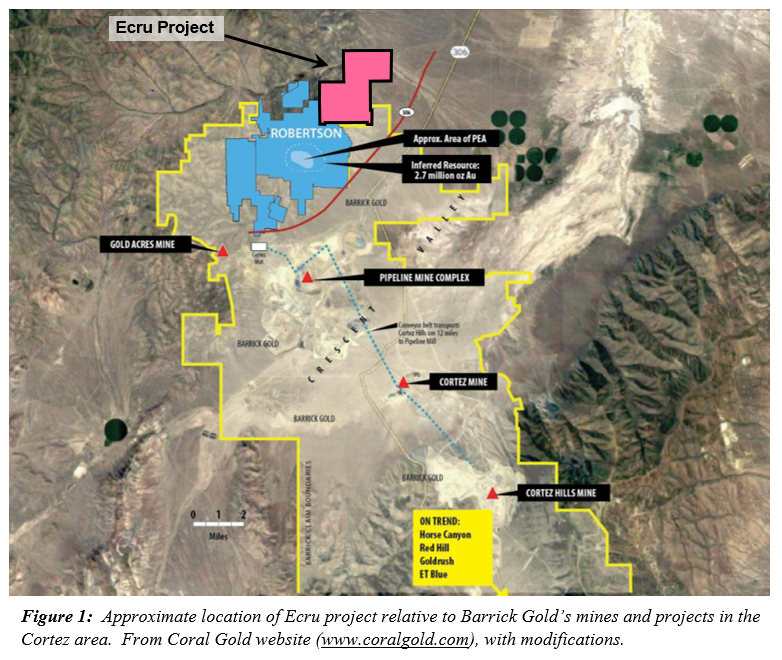 The Ecru Project is located to the north of Barrick's giant Cortez gold mining operations which comprises several multi-million ounce gold deposits, including Pipeline, Cortez Hills, Goldrush and Robertson (Figure 1). The project is subject to an earn-in agreement with S2 Resources (See NR dated July 31, 2017 and August 2, 2018). Robert Felder, President and CEO states, "We are very excited to begin drilling on this project, within sight of several world class Carlin-type gold deposits and possessing all of the features necessary for the discovery of another giant gold deposit. 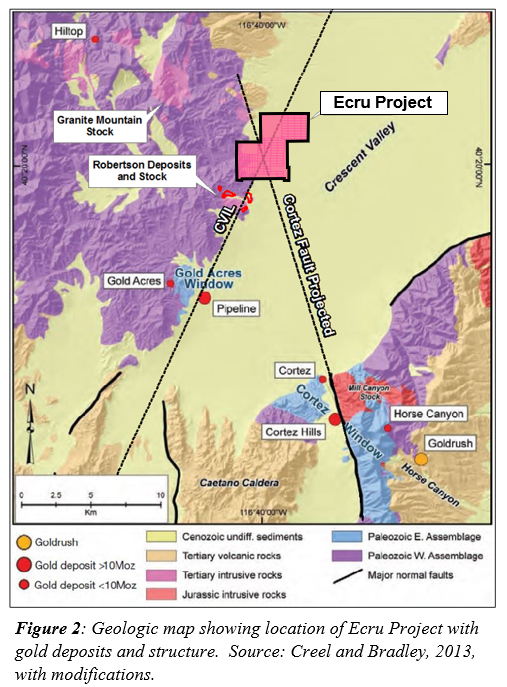 We're also especially pleased to have a strong partner who recognized the potential of this target area and have the financial strength and vision to carry out a meaningful exploration program beginning with detailed geophysics and now with 2 to 3 deep core holes as an initial stratigraphic test of the target area"
The Ecru Project lies in the prolific Cortez area of the Battle Mountain-Eureka Trend of gold deposits. The project area lies on the northwestward projection of the Cortez Fault, an important structural control on mineralization in the district, and where this structure intersects a regionally recognized northeast lineament (CVIL) (Figure 2). 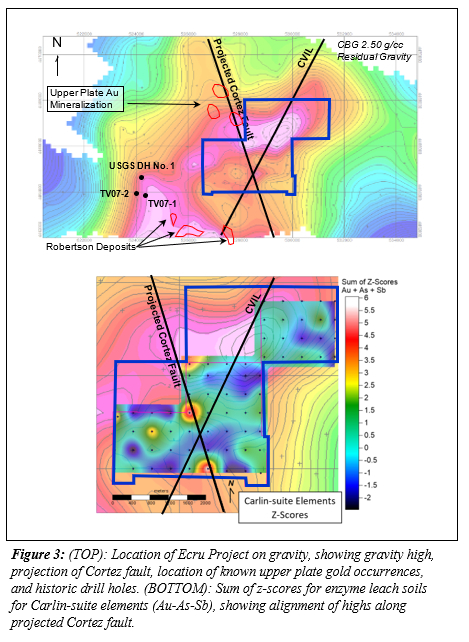 Detailed gravity, audiomagnetotellurics (AMT) and surface geochemical surveys have been conducted over the project area and provide favorable indications for the potential for Carlin-type gold mineralization at depth. A distinct gravity high occurs on the project which is currently interpreted to represent an upthrown block of favorable lower plate carbonate host rocks. In addition, a pronounced break in the gravity data corresponds with the northwestward projection of the Cortez Fault, and this relationship is further supported with multi-element surface geochemical data (Figure 3). Drilling by Coral Gold on the adjacent Robertson Property encountered anomalous gold mineralization in both upper and lower plate stratigraphy in holes TV07-1 and TV07-2, with grades up to 2.19 g/t Au (Source: Coral Gold Preliminary Economic Assessment, Robertson Property, January 2012). These drill holes and the Robertson mineralization and other nearby gold occurrences are spatially associated with the same gravity feature that we are exploring at Ecru. The U.S. Geological Survey completed a deep hole (USGS DH No. 1, see Figure 3) and encountered several anomalous gold values in both upper and lower plate stratigraphy, including several intercepts exceeding 1 g/t Au and a high of 4 g/t Au (Source: Wrucke and Cole, 1991, USGS Open File Report 91-585). This initial drilling program will establish the depth to favorable lower plate carbonate host rocks and will provide geochemical characterization of the host rocks in the target area. This along with structural information derived from the drilling will improve our understanding of the subsurface geology and allow us to vector towards the best targets. The drilling program is anticipated to last approximately two months. All technical data disclosed in this press release has been verified by RenGold's Qualified Person, Robert Felder, M.Sc. and Certified Professional Geologist (CPG #11012) as recognized by the American Institute of Professional Geologists (AIPG). Renaissance Gold Inc. is a western US focused prospect generator utilizing a joint venture business model. RenGold applies the extensive exploration experience and high-end technical skills of its founders and team members to search for and acquire high quality precious metal exploration projects that are then offered for joint venture to industry partners who provide exploration funding. RenGold maintains a large portfolio of gold and silver exploration properties and has entered into over 65 exploration agreements including those as its predecessor, AuEx Ventures Inc., and those from Kinetic Gold. RenGold's objective is to place its projects into exploration agreements, testing as many drill targets as possible and providing maximum exposure to success through discovery. This news release contains certain statements that may be deemed "forward-looking" statements. Forward looking statements are statements that are not historical facts and are generally, but not always, identified by the words "expects", "plans", "anticipates", "believes", "intends", "estimates", "projects", "potential" and similar expressions, or that events or conditions "will", "would", "may", "could" or "should" occur. Although RenGold Gold Inc. believes the expectations expressed in such forward-looking statements are based on reasonable assumptions, such statements are not guarantees of future performance and actual results may differ materially from those in forward looking statements. Forward looking statements are based on the beliefs, estimates and opinions of RenGold Gold Inc's management on the date the statements are made. Except as required by law, RenGold Gold Inc. undertakes no obligation to update these forward-looking statements in the event that management's beliefs, estimates or opinions, or other factors, should change.